The Fort McMurray fire began on May 1, 2016 and by May 3, 2016, it had swept through the Fort McMurray region. The fire eventually covered an area of about 590,000 hectares, larger than all of Prince Edward Island, and is one of the most destructive and costly fires Canada has ever seen. By the time the fire was 100 percent contained, it had caused mass evacuations of nearly 100,000 people, 2,400 completely destroyed homes (and thousands more needing severe reconstruction work), and upwards of $9.9 billion worth of damage. While the PuroClean team, including Chairman & CEO Mark W. Davis, Vice-Chairman Frank Torre, and President Gord Gamble waited for the fire to end its tear through Alberta, they strategically planned out how PuroClean would best use its resources. The first immediate step was to bring the 53-foot PuroClean command trailer from Detroit to the Canadian Distribution Center for stocking and preparation. A three-person liaison team traveled to Fort McMurray to assess infrastructure needs. The Financial Planning and Logistics, Field Operations, Business Development, and Client Services divisions assessed and applied resources. After the Alberta team had provided all of the equipment, supplies, and technicians they could, PuroClean teams from across Canada traveled to Fort McMurray to assist. When allowing workers in to help with fire cleanup and restoration of the affected area, the local government gave priority to Alberta residents. PuroClean mobilized to also send Alberta residents in first. While everything from the strategic plan to attack the devastation to infrastructure to employee lodging was being coordinated, the team was also planning which insurance carriers they would reach out to and in what order. When communicating with insurance providers, the PuroClean team negotiated a preferred pricing structure for its franchise owners, with their grief-stricken neighbors in mind. Because residents of Fort McMurray were not allowed back into their homes for three to six months, PuroClean first focused on commercial jobs. The first job the team did was for one of the city’s largest restaurants, The Wood Buffalo Brewing Company. The job was secured through Travelers Insurance. Signal Restoration Services, a leader in large loss property damage restoration and partner of PuroClean, helped guide the local franchise owners on how to handle large commercial jobs such as the one at The Wood Buffalo Brewing Company. One of the biggest logistical challenges PuroClean faced while cleaning the aftermath of the Fort McMurray fires was lodging. Habitable hotels were taken over by the local government personnel, but PuroClean needed to house its group of 125 technicians and managers. Instead of the costly option most other restoration and insurance companies chose (having staff stay at oil industry work camps), PuroClean worked with friends of Edmonton North franchise owner, Carol Parsons, to house employees in 25 apartments in the least-affected part of the city. The apartments were fully furnished and supplied with food, high-speed internet, recreation equipment, and more. While most of PuroClean’s services involve a need for immediate action, fires present the alternative. PuroClean franchise owners must wait until the fire is out, the timing of which is always an unknown. One of the harshest fires PuroClean has worked on in recent years was the Fort McMurray fire in Alberta. In total, hundreds of jobs came through the PuroClean command center from insurance providers, and franchise owners, executives, and technicians gave up months of their time to aid in the healing of Fort McMurray. Through June and July 2016, more than 125 members of PuroClean took on no less than 1,000 insurance claims from six separate carriers. Local PuroClean owners were still supporting the Fort McMurray community well into 2017. 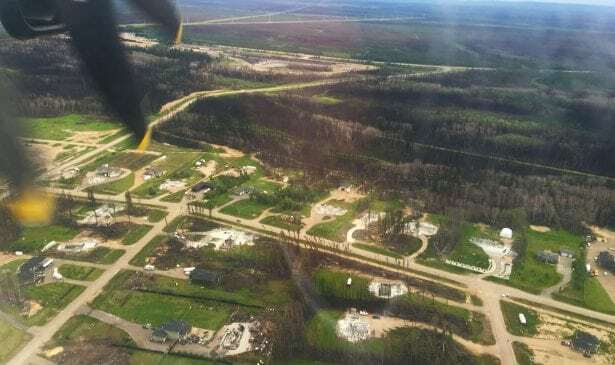 The Fort McMurray wildfires demonstrated the tenacity of PuroClean franchise owners in dealing with sizeable disasters, as well as exemplified the successful partnership between PuroClean and Signal Restoration Services to handle large-scale commercial jobs.